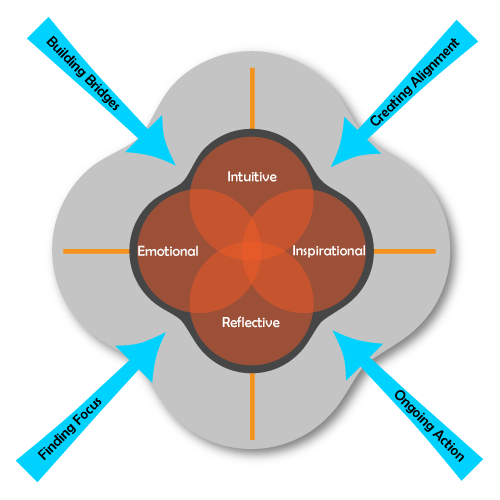 In this technique we take Enterprises through all of the 4 Values in the Quadrant by applying the 4 Levels of Insights. This technique helps our customer to produce a realm of opportunities to create wonderful new results, as we help them to alter their experiences in their journey. Each and every transformation brings with itself a change that is driven by insights on how things are being done or what needs to be changed to do things differently to achieve superior results. This forces many Enterprises to look at approaches or techniques to help take actions surrounding these changes. But just applying the approach or technique at a superficial layer does not bring about a long lasting transformational change within the Enterprise. The essence of transformational change is all about creating the space for collecting the insights and performing actions while being in the game, which we at Praxis Strategy Consulting believe strongly. We use the “Leading with Insight ™” technique to drive solutions for our customers problems. This helps us to enable and empower our clients to gain insights to the underlying dynamics of the challenges that they face and guide them to apply these insights in the real world to create the desired change.